Now that it’s officially fall, one thing in particular has been on my mind: pumpkin. Pumpkin picking, pumpkin pie, pumpkin spiced lattes, pumpkin carving, pumpkin everything. 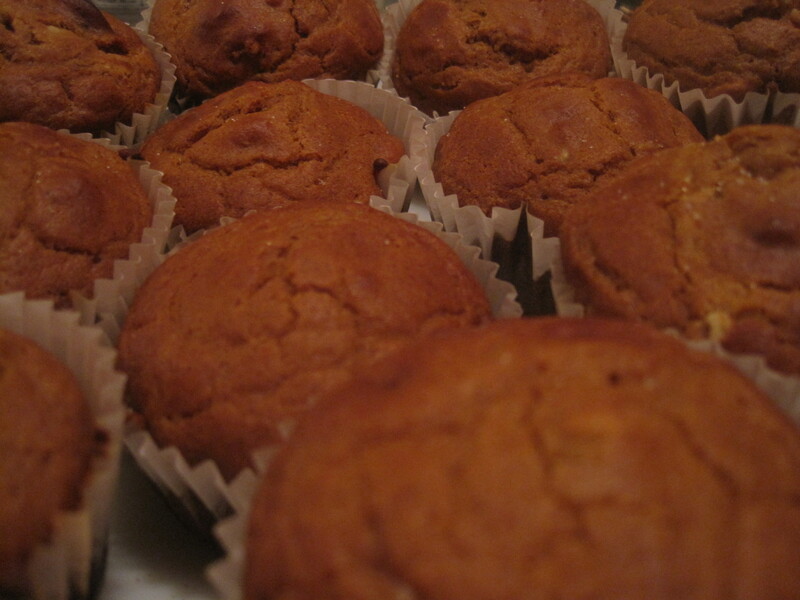 But since I can’t have everything all at once, I decided to make do with what I could and bake some pumpkin muffins. But this isn’t just your ordinary recipe; these babies are unique, perfectly soft ‘n’ fluffy and delightfully tasty. Enjoy with a glass of milk or hot cup of tea! 1. Preheat over to 375. Mix dry ingredients together, then adding in all the wet ingredients slowly. Mix well, being sure all the flour has dissolved but do not over-stir. 2. Bake for 15 to 20 minutes, or until slightly browned. 3. Sprinkle with a touch of cinnamon & sugar and serve warm…enjoy! 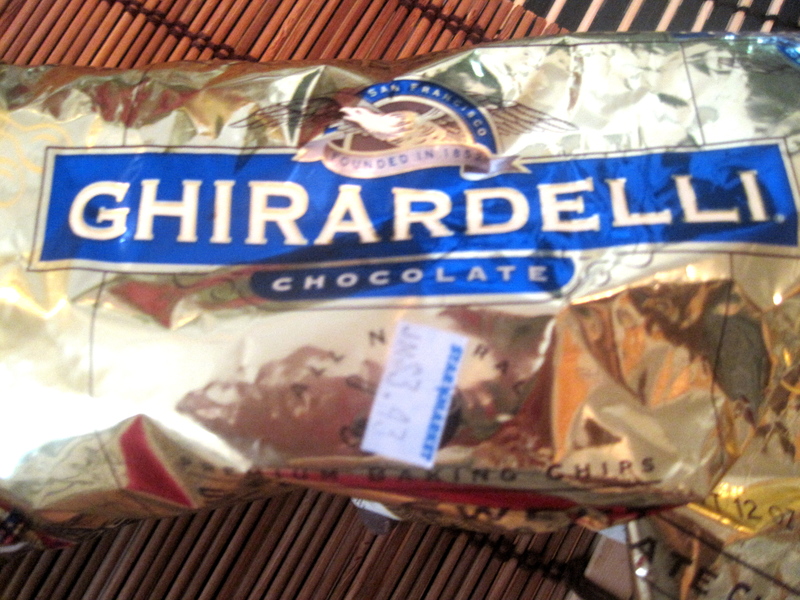 The other day after dinner, I reached into my cabinet for a handful of Ghiradelli Semi Sweet Chocolate Chips. I’m a huge fan of dark chocolate, and these little gems do it for me every time. “What are you doing? Didn’t you just eat dinner?” my neighbor asked, confused of why I was eating chocolate right after my eggplant lasagna indulgence. “It’s my dessert!” I shouted back at him. “What, you eat dessert?” Um, duh! And let me tell you: sometimes it’s a lot more than a handful of chocolate chips. Just ’cause I’m healthy doesn’t mean I resort to broccoli and peas for my post-dinner treat. Dessert. Ahhhhhh. Just the sound of it alone makes me feel all warm and fuzzy inside. It’s honestly one of the best things on earth, the perfect ending to a perfect meal. As you can see, I am totally a sweet tooth fanatic. But there is no way I’m going to have the taste of salad or pasta sauce in my mouth and call it a night. I at least need a piece of gum or a savory mint before I hit the hay. I know some people who brush their teeth immediately after their meal so they won’t eat anymore for the rest of the night, but I’m not one of those girls. I’m sorry, but the fresh, minty taste of my extra-whitening Colgate just doesn’t cut it. I’d rather have the real thing. No, I’m not saying I throw all “healthiness” to the wind and devour savory pumpkin pies, cheesecake and triple chocolate cakes every night (of course a bite or slice here and there is fine). No, no, no. I’m talking about little, healthful options that make for the perfect post-meal treat. Here, I share with you some of my favorite simple desserts so next time you can enjoy a little treat guilt-free instead of sucking on a measly Tic Tac. *frozen yogurt: Sometimes I take a walk after dinner to my local frozen yogurt shop for a tiny cup of tart yogurt. I love plain or chocolate, topped with fresh fruit. The best part is, usually these places are self-serve so you can control how much you’re eating. Really the tiniest little scoop does the trick for me! *handful of nuts: While this seems more like a day snack, sometimes all it takes is a small handful of raw nuts. I like almonds and walnuts, and sometimes I add in a few chocolate chips or touch of dried fruit to sweeten them up a notch. *homemade muffins: LOVE experimenting with new muffin recipes, especially now that it’s fall! From apple cinnamon to banana nut, you can’t go wrong with a muffin to satisfy you after a nice meal. Check out my recipe for healthy banana nut muffins! * pb & fruit: Scoop some all natural peanut butter onto sliced pear, apple or banana. Drizzle on some honey or agave syrup and a dash of cinnamon to satisfy your sweet tooth any night. *popcorn: I know, I know…it’s something you get at the movies, not for dessert. But let me tell you: it’s actually quite satisfying and fills you up pretty quickly. I like to make lightly salted, all natural popcorn and then I sweeten it up with cinnamon, nutmeg and organic sugar. My mom just bought me a popcorn maker, and I can’t wait to pop my own and explore new, creative recipes. I’ll be sure to share! What’s your favorite dessert? Do you tend to get a sweet tooth after dinner?